Do you like a simple story? Something straightforward, completely linear, no fuss, no muss? Well, this post may not be for you! 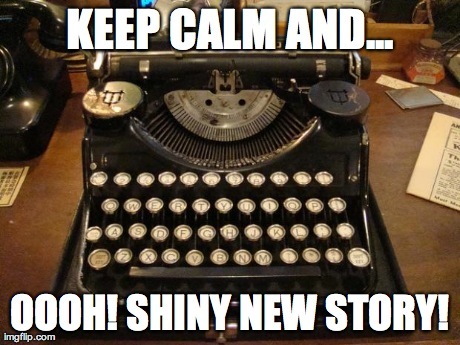 But stick around for some exciting information and maybe you, too, can come up with a ridiculously complicated story before you even write the first word! Ok, so maybe that's not a great selling point. But over-complicating a story is just kinda what I do. What's unusual this time is that I haven't even started writing it yet. So getting a new story idea could not come at a worse time for me. I really just want to be working on my third draft for UL, and I've got a lot of anthology nonsense to work on. I just do not have time to be working on something new, or even something different. But the universe had other plans, because I just got a shiny new story idea. 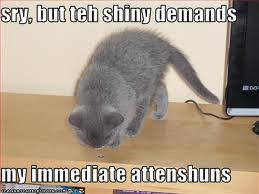 And boy, is it shiny! Meaning:terribly distracting. I actually got this story idea from a dream I had last week. There were two characters who were in an interesting situation, and when I thought about it afterwards, it was like: "Huh. Now why would they be in this situation? What has led up to it? Where do they go from here?" And so I kept thinking. And before I knew it, a plot started rapidly unfolding. The beginning of the story wasn't completely clear, but the middle and end seemed pretty solid, and actually, exciting. I couldn't stop thinking about it (SHINY!!!). Here's where it gets complicated. Based on the whole interesting-thing-about-my-characters'-relationship-that-makes-me-want-to-know-more-and-hopefully-the-readers-too factor, I know my story actually has to start in the middle. Why? Ok, I'll break it down. 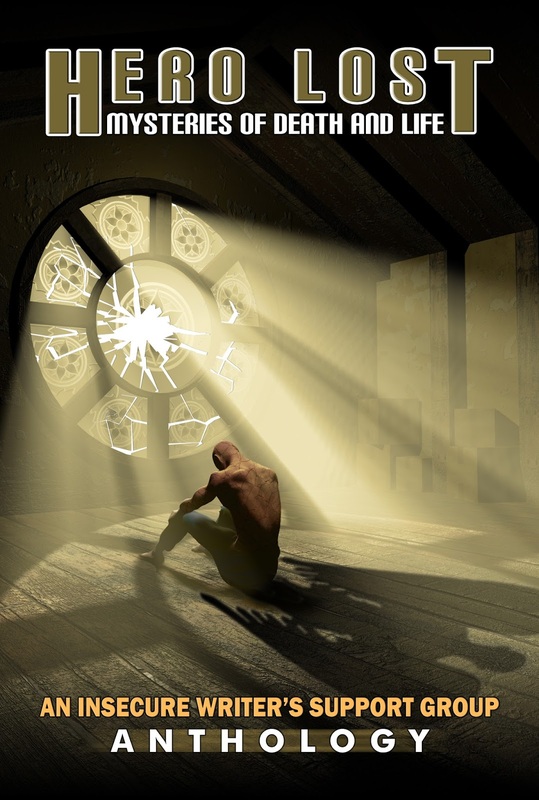 Basically one of main characters begins the story by telling the reader that he has two secrets. I'm thinking one of the secrets gets revealed during the first chapter. The other secret, however, I want to keep from the reader until maybe halfway through the book. I'll drop hints, of course, but I want there to be a reveal and have them go, "WAIT. WHAT?" Because why not?? So there's that. So basically the secret happens before the book even begins. I'm thinking there will need to be some flashbacks to explain how my characters got to this point. But that's not the only thing that makes it complicated. I know I have to have two POV characters. I really dislike doing it in most cases and try to pick a character to be the narrator, but in this case, I really think it has to be two. During some of the more suspenseful moments, my characters are split up, so you'll have to know what's going on with each of them. Plus one of my characters has a very complicated past and I know that will be the focus of most of his flashbacks. The other character doesn't really know that much about it but it will be important to the story. So this cover reveal today is awesome for many reasons. First of all, I didn't have the brain capacity for a blog post today! Since I worked this weekend, I'm exhausted and brain dead. I'm way behind on my reading goal and don't even get me started on the whole working on my novel thing. I'm trying to keep up with the promotion plans for this book, but to be honest, I'm a little overwhelmed. I also have to do laundry today. I think I need a day just to breathe (and sleep). But anyway, the more awesome reason is that the cover is here for the Hero Lost anthology! In which I am one of the authors! I still can't really believe it. 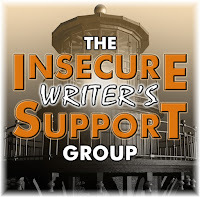 I think I'll have a post for February's IWSG that will go more in depth with how I made the decision to write my story and submit it (and will actually kinda be a sequel to an older post--weird). But I'll stop rambling. HERE IT IS!!! I find there are two different ways that symbolism pops up within my stories. Either I plan it ahead of time and figuring everything out before I even write it, or it just shows up on its own and then I have to dissect these moments and maybe even flesh them out so that the symbolism actually makes sense. Funnily enough, it's usually the latter. For the most part, I don't plan out symbolism. It just happens. When I say "symbolism" I actually mean a few different things. It can be actual symbols--an object or something that occurs and represents something else. Or it can be other things. Moments that connect over the course of the story. A similar theme or idea popping up over and over again. Really just anything extra that makes you stop and go, "huh." It means more than what is just there on the surface. But anyway, I'm getting off track. 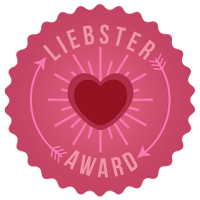 You're probably wondering what the heck this has to do with girls being bad kissers. I realized that while there are only two teenage girl characters in UL (and only one of them gets real page time), they had something in common. Jordan just had to tell the reader what sloppy kissers they were. I honestly don't even know where that came from. And it's definitely not supposed to be some kind of "Oh, he's only gay because every girl he kisses is terrible at it!" thing. No no no no no. I'm definitely not in the position to be giving any wrong impressions in this book. So why the bad kissing? In the first chapter he mentions going on one date with this girl Kristen, who is--obviously--a bad kisser. Later on in the book he actually does start going at it with another girl, Madison--also a bad kisser (until he shows her what's what). So. What exactly was I supposed to do with this nonsense? Cut it? 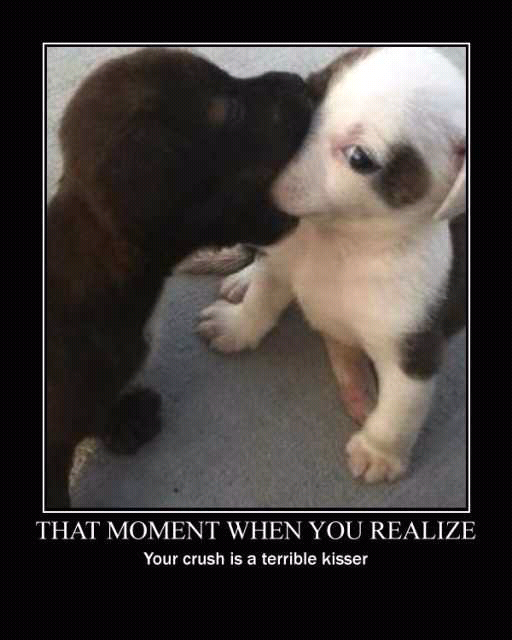 Only have one of them be a bad kisser? It just seemed like a weird thing to keep mentioning, and really wasn't all that necessary of a detail (especially for Kristen). I actually went in a different direction with my thought process. I thought about the main female character--Jordan's mom. It's pretty obvious throughout the book that she's a neglectful mother. I don't think she ever would have kissed her son, even when he was a baby. So what the heck does that have to do with my sloppy kissers?? Well, these are really the only three women mentioned in the book. I figured that maybe there was a way for some kind of symbolism to happen here (especially because I love things that come in threes for this book). The final scene with Jordan's mom has always been a big fight, although it's going to change a lot from the last draft and I still have to figure out what to do with it. But the basic idea is that she betrays Jordan in some way and he feels he can never forgive her. So I was thinking, what if in her desperation during this moment, to get his forgiveness and actually be a good mother, maybe she tries to kiss him--on the forehead, cheek, maybe even the hand--just something. And he still rejects her. I think it could be a powerful moment if done right. So I'm definitely still figuring it out. But I think there's something there. I think the bad kissing girls can be more about building up to the moment with the mother rather than having anything to do with sexuality or that sort of intimacy. Hopefully it will be fun to figure out and not too much of a struggle! I've been having a predicament when it comes to editing lately. Ok, I've had several predicaments over the course of editing this novel, but one in particular seems relevant right now. I finally finished up my Chapter 3 edits and Chapter 4 should be relatively easy (just line by line edits, no major changes--hopefully I can get it done in one day). So that brings me to Chapter 5, and also to my predicament. Well, technically it's about Chapter 5 and Chapter 6. They've always gone pretty much the same way. In Chapter 5, my characters admit that they're attracted to one another. In Chapter 6, one of the characters reveals a darker secret, and then my narrator is left wondering what to do with all of this information. My concern with this is that I've been feeling like Chapter 6 may be slowing the story down. It's basically just a giant conversation. The information is important, but I've wondered if it really needs an entire chapter to get the point across. So what I wanted to do was take all of the important bits and move them onto the end of Chapter 5 instead. Then the story could keep going at a faster pace. Well, that's what I planned on doing, anyway. Now that the moment is finally approaching, I'm not so sure if it's the right decision anymore. There's already a lot going on in Chapter 5. Every part of the story beforehand has basically been leading to this moment. So it's a lot to deal with already. Then the information in Chapter 6 is a lot to take in as well. So maybe it's too much to put into just one chapter. There's also what happens after these chapters. Basically a decision has to be made and I'm worried if I combine these chapters that the decision happens way too quickly. Maybe it won't seem realistic anymore if the action is sped up. There's a thought process involved and if I speed up that process it may seem irrational. So what to do? Speed it up or slow it down? I'm leaning toward the latter at this point, AKA keeping exactly the way it's always been (just writing it better, of course). That way--hopefully--the reader won't be overwhelmed and wondering what exactly is going on. 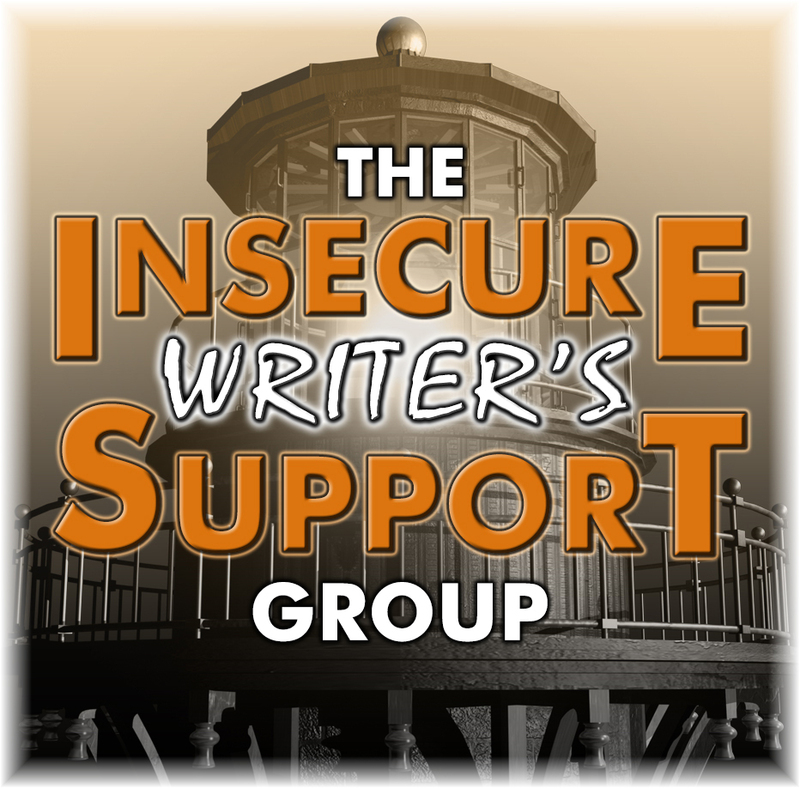 It's the first Wednesday of the month, which means it's the posting day for the Insecure Writer's Support Group. Click here to learn more and sign up! I'm pretty sure I've had some version of this goal for the last six years (for the 1st and 2nd drafts), and probably this exact goal last year (and the year before...). I think I want to finish it by the summer (maybe June-July), although I wouldn't be opposed to anytime sooner than that, and get some actual beta readers for it. Then once it's done figure out what to do with it. 2. Get back into blogging. In 2015 I went a little psycho and blogged every Monday, Wednesday, and Friday. Last year I didn't blog much at all. I'd like to blog every Monday at least. I really have no idea what's been going on with other bloggers lately, too, so I'd like to make sure I visit everyone more often and branch out more to new blogs. 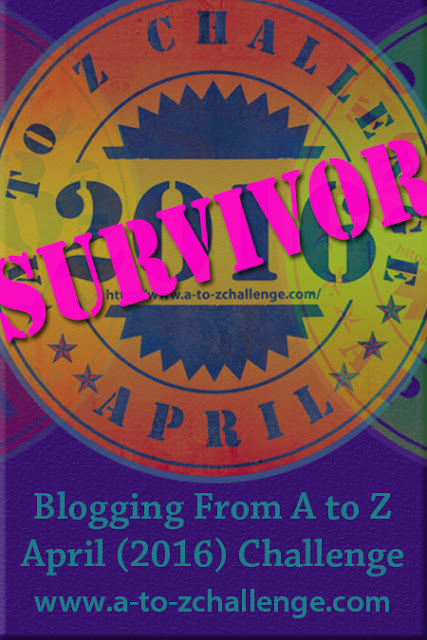 I'm on the fence about doing the A to Z Challenge this year. I actually do have an idea that won't be a ridiculous amount of work and could be fun, but I'm just not sure if I'll have the time. I know, this is waaaaaay in advance, but I figure I need to start thinking about it now. I've halfheartedly made this a goal a few times before, but I've never accomplished it. I've never even come close. So this year, I'd like to do it. AND: I want to write the sequel to Uneven Lines for it. That's why I want to start planning it now. I want to make sure I have every detail mapped out before I start writing. There's also a bit of research involved so I'd like to get that done before writing rather than sorting it out after. I've made this goal before, and I know it's incredibly unrealistic. But I still want to try it. Last year I only read 3 books (one of which was a reread), which was pretty pathetic. While I'm not exactly sure if I'll reach 100, I'd like to get closer than ever before. I'd like to read all of the books I already own, and not just fiction--nonfiction, poetry, etc. I think if I have a few books going at once it may help. We'll see. 5. Watch 100 new movies. I've made this goal before but I've never actually achieved it, even though it would be much easier than the 100 books goal. Last year I only watched 48 movies, which was way less than my usual low 80s from the two years before. If I watch one movie every three days or so, this should be pretty easy. Only movies I've never seen before count. 6. Have an awesome 30th birthday. Ok, so it's not until August, but I'm already trying to plan it. Well, because for Christmas, my husband got me Hamilton tickets (!!!!!!!!!) for the day after, and I bought tickets for the Amelie musical on my birthday. That's all I have so far, but I have lots and lots of time to plan everything else. I'm hoping to travel to NY the day before my birthday and leave two days after. So that's it, pretty much. I would like to look into publishing some smaller things (like all those poems that have been sitting around collecting dust), lose some weight (and keep it off! ), organize my apartment, yada yada. The really good news is that I've actually started out the year with a big accomplishment, but I think you'll read about that somewhere else...*insert evil laugh* Hopefully I can take the momentum and run with it. Do I have terribly unrealistic goals? What are your goals for the new year? I just want everyone to know that Sarah picked the title for this post. Because she's nuts. I will not be dancing around and singing like Thomas Jefferson, thank you very much. Well, I could sing, if you ask really nice (or bribe me with chocolate). But no musicals! Here, I'll sing a little something for you...I know something you don't know! OUCH! Sarah just pinched me! She's so mean. Seriously. Just wait for Book 2. Torture city. WHERE WAS I???? Stop distracting me! So yes, I have been gone for quite some time. My last blog takeover post was in August (whaaaaaaaaat?). Now, I wouldn't say that I've been lazy (so you shouldn't, either), but in my defense, it's hard to motivate myself to write a blog post when Sarah isn't really writing them either. I mean, really. What do you people want from me? There was supposed to be a point to this post, wasn't there? I can't really remember what it was. Ok, so the title is kind of fitting. I've missed quite a bit. But you've missed everything about me, too! I mean, I finally turned 21 and nobody threw me a booze soaked Muse Party?? Rude. It's ok. In the real world, Adam and I went clubbing and we danced and I blacked out. Fun times. In muse world, well...I guess I took a nap or something. Also fun times. But what's going on in blogging world (exactly how many worlds are there...?)??? Fill me in. I'm running out of things to talk about here. Uh...what's everyone's favorite kind of tea? If you can guess mine then Sarah will make you a batch of cupcakes. No I didn't ask her, but it'll be fine, trust me. I'm very persuasive.